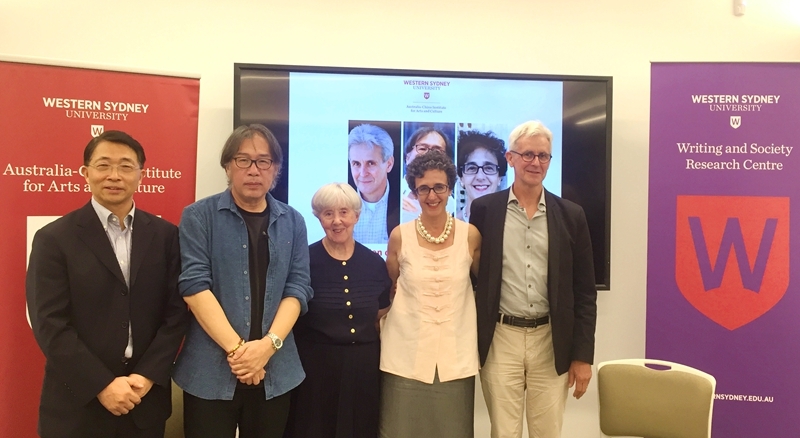 The well-established poet and scholar from Beijing, Xi Chuan (西川), Dr Giuseppa Tamburello from Italy and Professor Nicholas Jose from Australia formed a panel at the Australia-China Institute for Arts and Culture on November 28 to discuss contemporary Chinese literature. Xi Chuan is Professor of Chinese literature at Beijing Normal University. A poet, essayist and translator, he has published nine books of poetry and his works have been translated into many languages. His works won for him, among other things, the distinguished Lu Xun Literary Award in 2001. Giuseppa Tamburello (aka Qiusi or 朱西) is a Senior Lecturer in the University of Palermo, where she teaches Chinese language and literature. Her research interests include modern and contemporary Chinese short stories and poetry and she has also been an extensive translator of Chinese literature into Italian. Nicholas Jose is Professor of Creative Writing at the University of Adelaide, Adjunct Professor at Western Sydney University, and also a celebrated Australian novelist. Referring to a workshop in Adelaide a few days earlier, Nicholas Jose spoke of the problems that confront all translators of Chinese writing, such as language barriers between English and Chinese, generic non-equivalence and editing problems. He agrees that, while literary translation might be difficult in general, poetry was, contrary to general understanding, not the most difficult genre. He speculated that this was because poets dealt with problems common to all people in the modern world, such as alienation and cultural identity. Giuseppa Tamburello reviewed Chinese history and crucial influences on contemporary writers such as the Cultural Revolution and June 4 1989. She argued that one could make better sense of contemporary Chinese writing if one understood the historic context of its creation. Xi Chuan looked at the contemporary period of Chinese writing and applied an analysis based on China’s socio-economic developments in the successive decades of the 1980s, 1990s and 2000s. 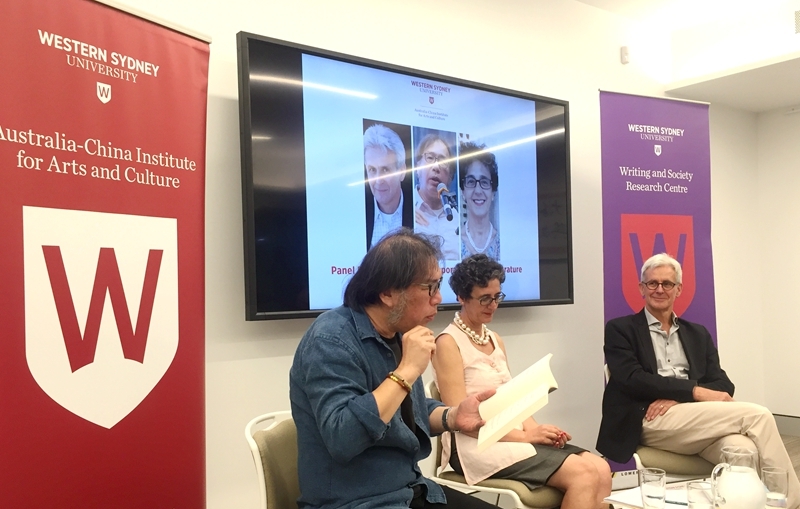 He also emphasised that Chinese writers did not write in isolation but had access to contemporary works from Europe, America, Oceania and the rest of Asia, and their own works were increasingly available in translation and to Sinophone readers. Xi Chuan concluded his speech by reading one of his own poems, The Plains 平原, in the original Chinese and in English translation. The panel inspired many interesting questions from the audience who extended the discussion to more subtle issues such as regional differences in Chinese literary writing, the Italian translation and reception of Chinese literature, contemporary Chinese poetry and critical approaches available for use in the reading of contemporary Chinese writing. Among those attending the discussion were Professor Ivor Indyk from the Institute of Writing and Society, Professor Peter Hutchings, Dean of the School of Humanities and Communication Arts, and some students and visiting scholars from other universities including Macquarie University and the University of New South Wales.